Lisfranc injuries occur when there is a breakage of bone in the midfoot or when supporting ligaments in this area are torn. This type of injury can range in severity from mild to debilitating and may be simple or complex, depending on how many bones and joins have been affected. A lisfranc injury is frequently diagnosed as a simple sprain, particularly if it is attributed to a twisting of the lower limb during a misstep or fall. Lisfranic injuries are different from sprains however; they are more complex and attempts should never be made to simply `walk it off`. This type of injury can be severe enough to warrant several months of healing and might, in some cases, require surgery. The midfoot refers to the mid region of the foot, which houses a collection of small bones that work together to create an arch on the top of the foot. Five bones (metatarsals) extend from this cluster all the way to the toes. 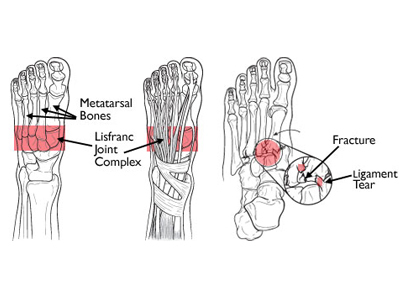 The metatarsal are stabilized by the presence of the ligaments (connective tissues) that stretch both horizontally and vertically through the foot. The first metatarsal is an exception here however; there are no connective tissues anchoring it to the second metatarsal, which makes it vulnerable to dislocation or being broken during a fall or a twisting of the foot. The midfoot is a crucial stability point in the arch and plays a primary role in walking. While walking, the midfoot is responsible for transferring the force generated by the calf muscle to the front of the foot. This particular network of joints is stabilized by a complex structure of bones and ligaments. Interesting Fact: The network of joints found in the midfoot has been named after Frenchman Jacques Lisfranc de St. Martin, who served as a surgeon in the Napoleonic army. Problems arise in the midfoot when bones are fractured or broken or if ligaments become torn or ruptured. Simple injuries are those that affect a single joint while more complex injuries will negatively impact multiple joints. Multiple fractures in the bones of the midfoot are considered a complex injury. Lisfranc injuries require medical care as they often damage cartilage in the joints, and since cartilage covers the ends of our bones to allow for smooth, easy movement, this can be a serious problem both in the present and the future. Severe injuries to this part of the foot must often be treated with surgery, or cartilage damage and over-taxation of the midfoot joints will likely occur. Either of these complications can lead to flatfoot or arthritis, which leads to more extensive problems in the future and may also require surgery to correct. Unfortunately, arthritis may still occur later in life, despite successful surgical outcomes for Lisfranc injuries. Injuries of this type are often caused by twisting the foot or falling. It is classed as low-energy injury because it does not require great force and has been regularly observed in people who have sedentary lifestyles. One of the most frequent means of injury is to stumble or fall due to flexion of the foot (the foot pointing downward and catching on the floor). But athletes are not immune to this type of injury; football and soccer players are particularly susceptible due to the nature of the sport. The injury may be severe if there is marked direct trauma, such as falling from a height and landing badly on the foot. These types of injuries are classed as high-energy and may cause dislocation in one or more joints and/or multiple breaks or factures in the bones. Pain and swelling on the top of the foot. Bruising on the bottom of the foot as well as the top. When bruising occurs on the bottom of the foot is highly indicative of a Lisfranc injury. Pain that increases when walking and/or standing. The pain may be severe enough to warrant the use of crutches. Note: If you are being treated for a sprain (rest, ice, elevation) and symptoms do not improve over time you should seek a second opinion. 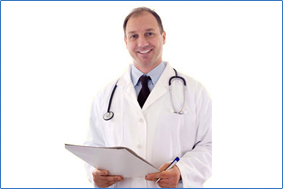 An orthopedic surgeon can help you with your diagnosis. Your health care provider will discuss the cause of your injury, your symptoms, and any other factors that are relevant to your examination. A physical examination will follow, and though some of it will be painful you will not sustain further injury despite the discomfort you may feel. Bruising on the bottom of the foot is highly indicative of a Lisfranc injury, so your doctor will likely check for this first. This type of bruising typically indicates either a midfoot fracture or a complete tearing of the ligaments in this area. Sensitivity and soreness when pressure is applied along the midfoot. Pain response to a stress examination of the midfoot: your doctor may twist the front of your foot while grasping the heel in order to evaluate pain levels (when pain is present). The same stress test would not cause pain in the uninjured foot. Your doctor may move your toes up and down in order to check for pain symptoms. This is known as the ‘piano test’ and the stress it places across the midfoot will cause discomfort when injury is present. Your doctor may ask you to perform a single leg heel rise, which requires you to stand on one foot and leverage upward until you are on your "tip toes." This move places your midfoot under considerable stress and can reveal even mild injuries. This test will not cause pain in an uninjured foot. X-Rays: Both fractured and completely broken bones—as well as the position of those bones—will usually be visible in an x-ray image, though it sometimes happens that an x-ray will show no damage when injury is present. This is why the physical examination remains important. X-rays will also show any changes and misalignments of the Lisfranc joint, both of which are suggestive of injury to the ligaments. If the injury occurred due to a low-energy incident and no breakage to the bone is suspected the x-ray may be taken from the standing position, as your doctor will be checking solely for injury to the ligaments. Injuries from a simple twist and/or fall will not be made worse by a weight-bearing x-ray. For instance, if the injury did not require surgery before the weight-bearing x-ray was taken it will not need surgery from standing for an x-ray. Your doctor may take an x-ray of the uninjured foot for the sake of comparison and to determine the ‘natural’ stability of those particular joints. Magnetic Resonance Imaging Scan (MRI). An MRI is a test that uses a magnetic field and pulses of radio wave energy to photograph tissues inside the body. This type of scan allows for more precise images of soft tissues such as tendons. While an MRI scan isn’t mandatory when diagnosing a Lisfranc injury it may be used to clarify cases where the diagnosis is in doubt. Computerized Tomography Scan (CT Scan): A CT scan is performed using a digital geometry processing scanner to generate a three dimensional image of the inside of an object. Several two dimensional pictures are taken of the same area different angles and then superimposed to create a 3-D image. CT scans are more detailed than x-rays and are used to create cross-section images of the foot. These scans are not required for diagnosng a Lisfranc injury. Because a CT scan will help evaluate the exact extent of the injury and the number of joints that have been damaged your doctor may recommend this scan to better determine the extent of the injury, particularly when surgery is required. Unless fractures or dislocations of the joint are present or ligaments are completely torn non-surgical treatment may be all that is required for a full recovery. Non-nonsurgical treatment plans frequently require the wearing of a weight-bearing cast for approximately six weeks, or according to injury. It is absolutely imperative that you not put weight on the injured foot during this period of time. After the six week period has passed a removable cast-boot or an orthotic device is used to replace the weight-bearing cast. The recovery period will require regular check-ups with your doctor that will likely require further x-rays be taken in order to confirm that the foot is healing properly. If it is determined that the bones in the injured foot has shifted out of their correct alignment surgery may be required to realign the bones. For protection from the top of the foot to the shin by reducing pressure, shear forces and friction. 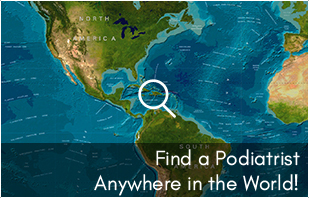 Popular product used as an interface between the foot and the boot. 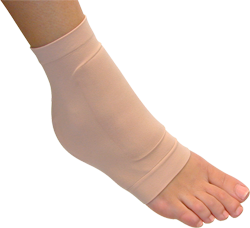 Comfortable elastic sleeve holds moulded, anatomically designed gel shape in place on top of the foot. Surgical intervention is generally required for any injuries showing a fracture of the joints in the midfoot or injuries showing abnormal subluxation (dislocation) of the joints. Surgery is performed to correct the alignment of broken or fractured bones and realign the joints. If at all possible surgery should be performed 12-24 hours after injury, though it may also be performed 7-10 after injury in order to reduce swelling. This procedure utilizes plates or screws to hold the bones in correct position after they have been realigned. This hardware is usually only temporary however, as it usually crosses mobile joints and needs to be removed to allow for joint movement. Plates and screws are typically removed 3-5 months after surgery, when the surgeon has determined that sufficient healing has taken place. Because the hardware is placed across moving joints and bones it sometimes happens that they break before their removal date. This is not unusual as metal can develop wear and tear in its structure from repeated bending, much as a paperclip will break when repeatedly bent and straightened. Breakage typically does not affect surgical outcomes; this process is usually successful even if the hardware fails. When internal fixation is used to treat Lisfranc injuries a variety of placements can be used when inserting hardware. Several screws may be used to fix the bone or a combination of plates and screws may be used if both fractures and torn ligaments are present. In certain cases when the injury will be too severe to be otherwise repaired fusion may be used as the initial treatment option. This is essentially a surgical procedure that that welds the damaged bones together to create one solid, un-shifting mass. Lisfranc injuries requiring this type of treatment include joints so severely ruptured they are no longer able to heal correctly using plates or screws. No hardware needs to be removed after this particular procedure as they will not be used; the joints will be fused together and completely immoveable after the healing process is complete. Post-surgery recovery from either fixation or fusion requires wearing a non-weight bearing cast or a cast-boot for 6-8 weeks after surgery. Weight-bearing activities are typically introduced while the patient is still using the boot, but only if there is sufficient healing. X-rays are often taken to monitor the patient’s speed and level of healing. The patient will only be cleared for further weight-bearing activity and general activity at the surgeon’s discretion. Even simple activities like the length of time a patient is allowed to walk for will be determined by the surgeon. High impact activities such as jumping, running, and skipping should be avoided until the hardware is removed. While there are many ways to treat Lisfranc injuries some athletes will not return to the pre-injury level of capability they had before becoming injured. And no matter how stellar the surgical intervention—fixation or fusion—arthritis may develop due to cartilage damage. All in all chronic pain may result from a Lisfranc injury and the patient underwent fixation initially fusion may still be required in the future.